So by now everyone is probably tired of seeing pictures of kids and pumpkins. Sorry. I couldn’t resist sharing the pictures of the pumpkin festival at our local playground. When we first moved to Warsaw, I did not like ‘the beach’ playground, as it is called. There was a shell of a building (walls, beams and floors only) behind it and no work of any kind being done in what seemed forever. The playground is also on the corner of two busy streets. Now, I’ve started to see all the activity happening at the plaza next to the playground and work finishing on the building behind it (yay!) and my mind has changed. And, you can’t really hear the traffic once you are on ‘the beach’ anyway. Things are not always what they seem. Especially when you are living in a new country and city! It is a perfect place for the markets and other events that seem to be scheduled every other weekend. Plus the playground itself is pretty cool with a pirate ship and great climbing structures. In fact, my friend’s kids were super excited to try out the playground for the first time. The Pumpkin Festival is what we went for. It will be there two weeks ending on Halloween. 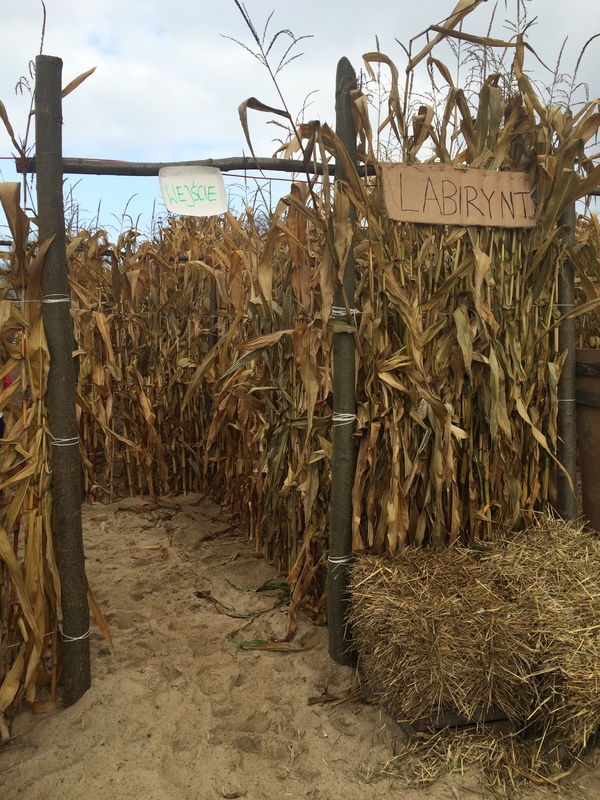 There are pumpkins for sale, pony rides, food trucks, baked goods for sale and a corn maze. The day we were there they were playing American country music on the speakers. American hip hop is everywhere but this is actually the first time I’ve heard Dolly Parton in Europe. We had hamburgers and hotdogs (well, a Polish kielbasa in a bun) from the food trucks. Then we had a slice of chocolate and beet cake. Miss H loved it and so did I (especially with the hidden vegetables). I will have to find a recipe. I see online that at the Festiwal Dyni there will be a pumpkin carving competition and other related competitions and something happening on Halloween but I can’t seem to find the schedule or any specifics. I suppose we will just have to show up and find out.